Many clients write us asking about our voice over services indicating their interest in hiring cheap voice overs. Generally, when a client asks us for a cheap voice over, we understand that they know the prices for professional voice overs and they’re looking for something that fits their budget for a certain project. Perfect, no problem. Here we explain how we manage these jobs at our company and the difference between cheap voice overs and affordable voice overs. 2 What are low cost or cheap voice overs? 3 What are affordable voice overs? To be clear, a lot of people are looking for something cheap or low cost, not something affordable, and that’s the first thing we explain to our clients. Cheap and affordable may seem like synonyms, but they have different connotations in this sector. Hiring low cost or cheap voice overs is not the same as hiring affordable voice overs. Why? What are low cost or cheap voice overs? Low cost or cheap voice overs are those that are well under the market price and, in almost all cases, are recorded by voice artists who are not professionals (without training or much experience, without a properly set-up recording studio, who deliver files with low audio quality and who don’t respond professionally to the demands of the project management: speed, seriousness, commitment, etc.). You can get a low cost or cheap voice over for a corporate video for 20 EUR, but don’t expect the audio quality to be good, or for the audio to be clean and edited, or for the voice artist to use the ideal register for your brand, or to be available to make quick changes to the text, etc. We’re very certain that your general satisfaction level will be pretty low in most cases, simply because you’re not working with a professional voice artist. In fact, many other clients come to us to solve one problem: redoing their cheap voice over with an affordable professional voice over. What are affordable voice overs? 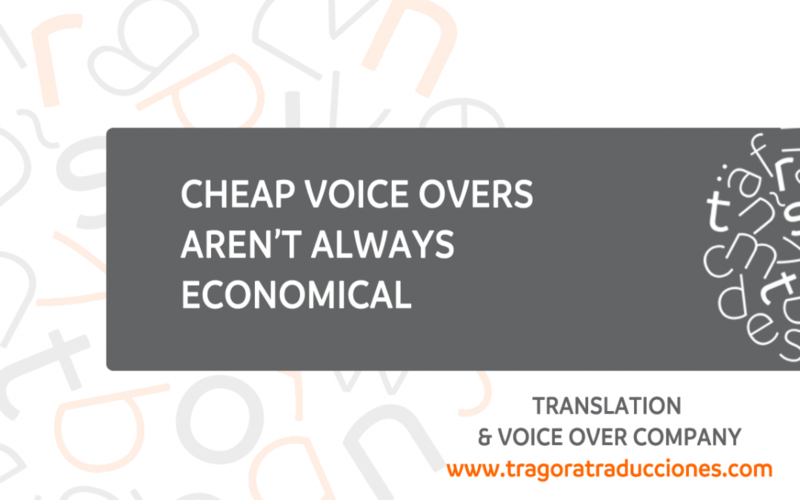 At Trágora our goal is always to offer the most affordable voice over services possible to our clients according to their needs and according to the project, without having to lower prices so much it sinks the market, because in the end that negatively impacts everyone. Professional voice artists dedicate a lot of effort and investment into achieving the highest quality for your jobs, and as long as the client’s budget is within reason to maintain professionalism, recognition and work volume, everything is negotiable. In the end, what matters to the client is that the voice over services are affordable while maintaining quality. That’s why low cost or cheap voice overs aren’t always affordable. By saying that, we’re not claiming that companies or voice artists who charge very low rates for voice over services are bad companies or bad professionals, but (the majority of the time) if we perform a detailed analysis of their service and their proposition, it ends up being more expensive in the long run, which isn’t what we want. There will always be companies and voice over professionals who are very competitive, as is the case with us, and who can offer the highest quality at a great price, offering professional voice over services to their clients. There’s no accounting for taste, and each client is free to choose whom to work with and what voice over fits their needs, especially now that the Internet has opened up endless possibilities when it comes to looking for professional voice artists. However, the hard part is knowing how to make the right choice so you can count on a service that offers trustworthiness, peace of mind, security, and competitive prices. If you’re looking for low cost voice over talents or cheap voice over artists, Trágora is not the company you are looking for. But if you’re looking for affordable voice over taletns, request a voice over quote, tell us about your project, and we’ll discuss it and try to find the right solution that fits your budget.